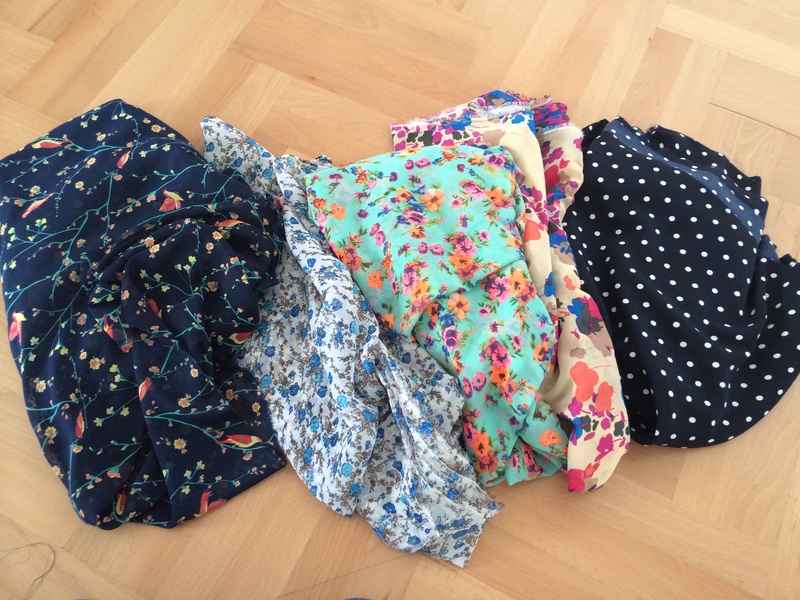 First order of business – I received my fabric.com and Hawthorne threads orders yesterday and today… so I have a mound of oh-soooo-pretty-I’m-drooling fabric and no patterns to sew it with! 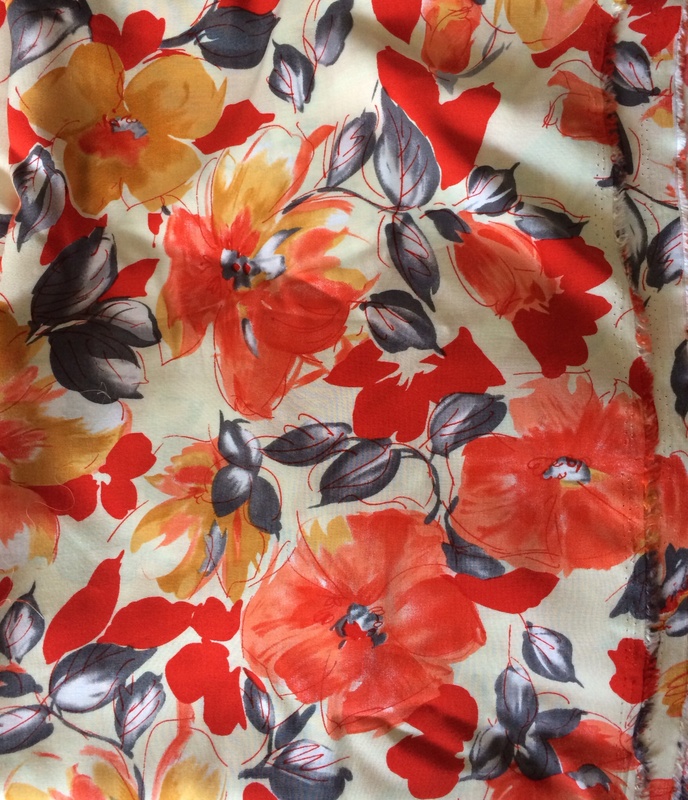 So last night, I got my tape measure, and some of Bubbas paper and crayons out, sat in front of some Grey’s Anatomy re-runs and drafted a wrap around skirt pattern, using some of my cheaper fabric I found here in Tbilisi, a lightweight cotton floral print. 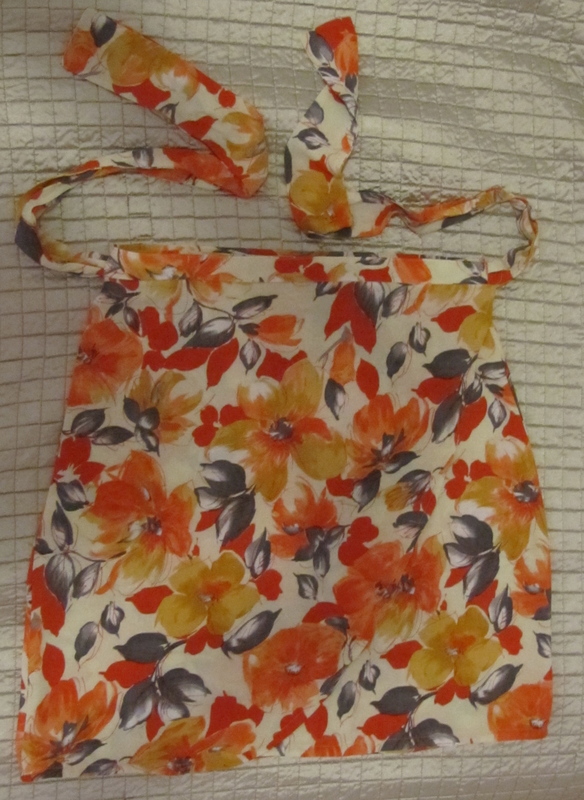 I used 1 back piece and 2 front pieces as I am having the skirt wrap at the front. 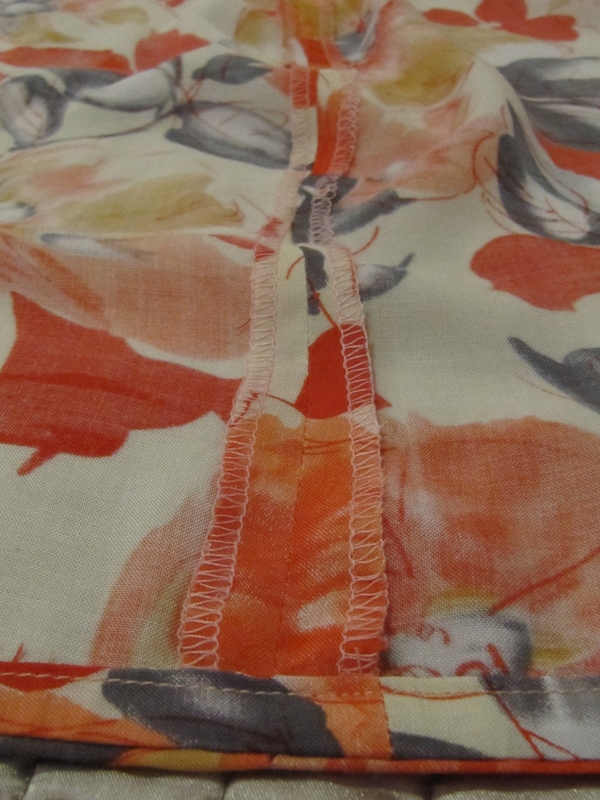 When I put together the three pieces and tried it on, it was much too ‘flowy’ as I cut each piece to be almost double the width at the bottom as the top. So I took the seams in to be a little more “tulip” shape, and cut the front piece to be also what I call “tulip” – oh just look at the picture and decide for yourself – doesn’t flare out at the bottom. 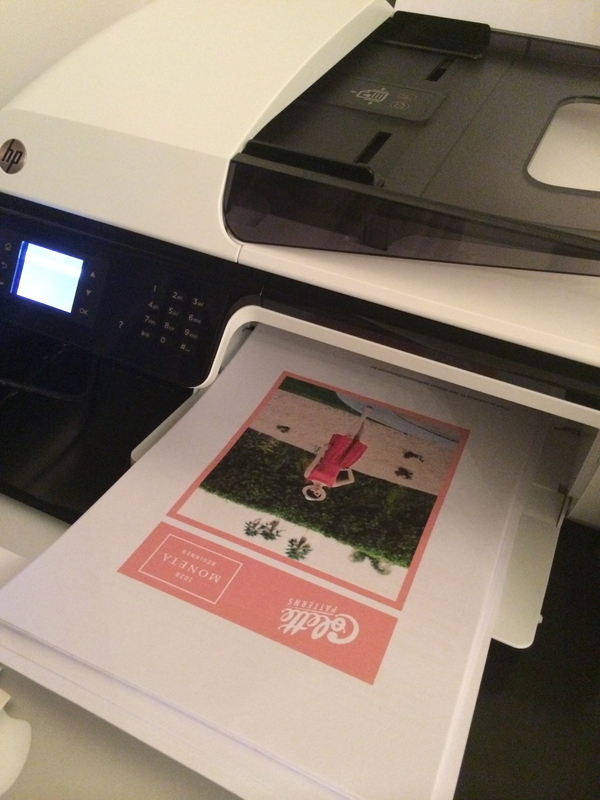 It is hard to see how the front overlaps in this picture, I’ve done some unintentional print matching……!! 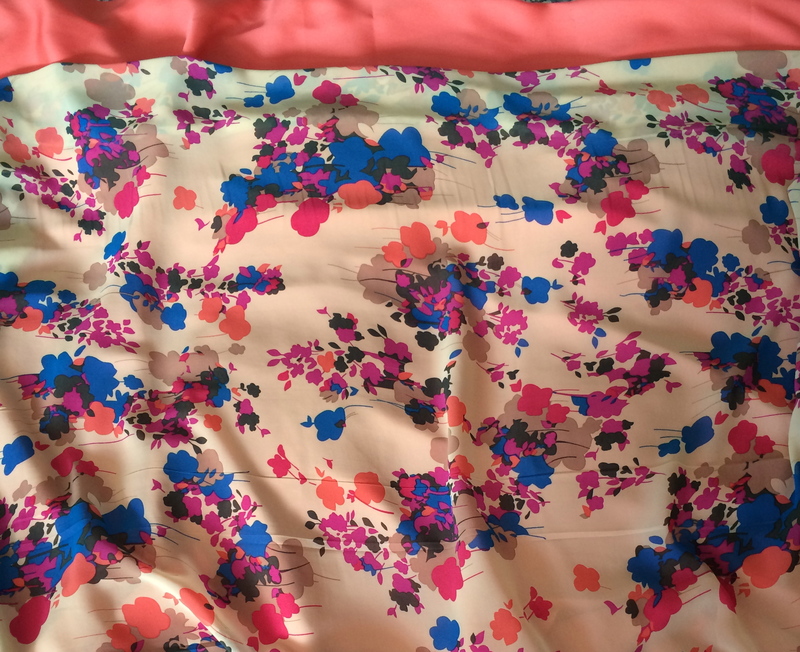 In any case, because the front piece was curved now from the waistband down along the hemline, I was wondering how on earth I was going to do the edging without it puckering and a LOT of effort (and then hem the remaining part of the skirt the same!?)…. 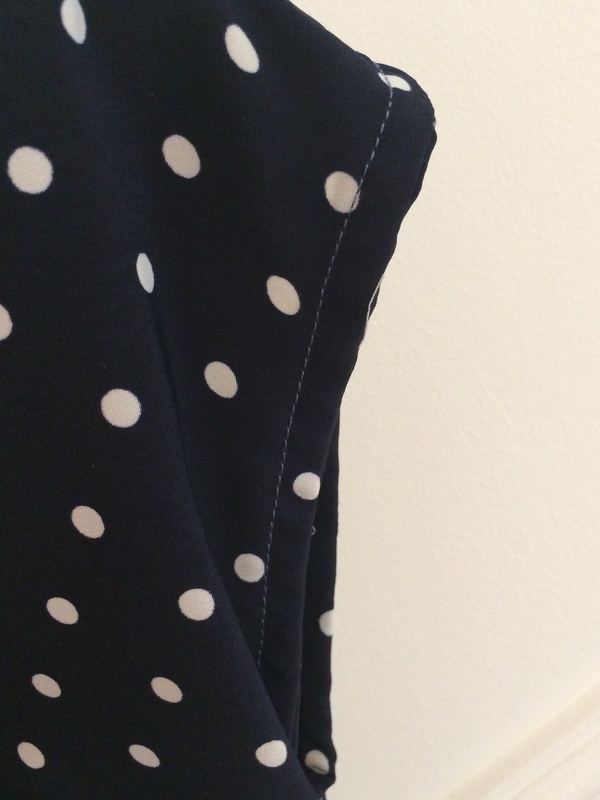 so I used a strip of fabric cut on the bias folded over once, and sewed it raw edges together all along the edge and hem, then ironed it away from the fabric, and folded over and sewed it down (see this MUCH more thorough explanation of the same for a neckline here). I had just done this method for a neckline the other day so thought it would be a neat finish taking into account the curve. Before I did it, I just made sure that the skirt was at a good length!! 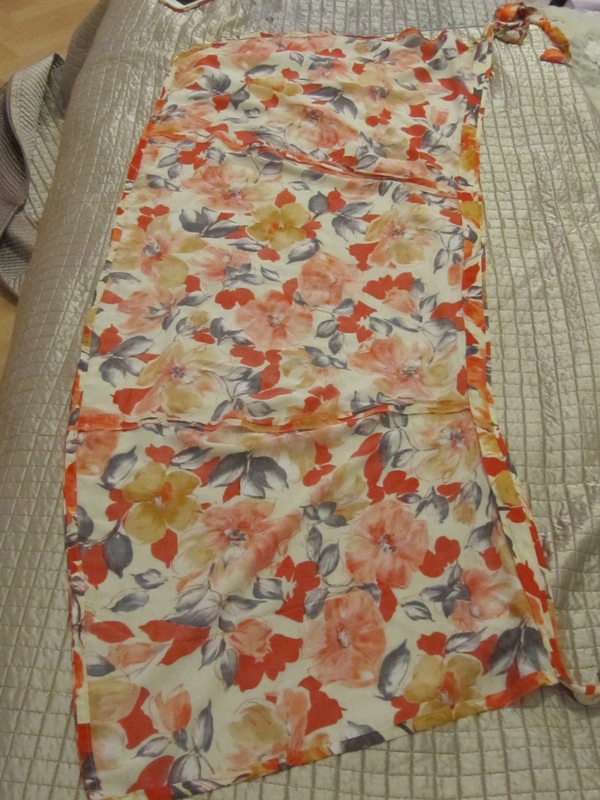 Skirt laid out (on my bed!) Can see how the the inner front (closest to bottom) and back piece (middle) both have straight lines yet the front piece (at top of pic) curves from waistband down along the hemline. 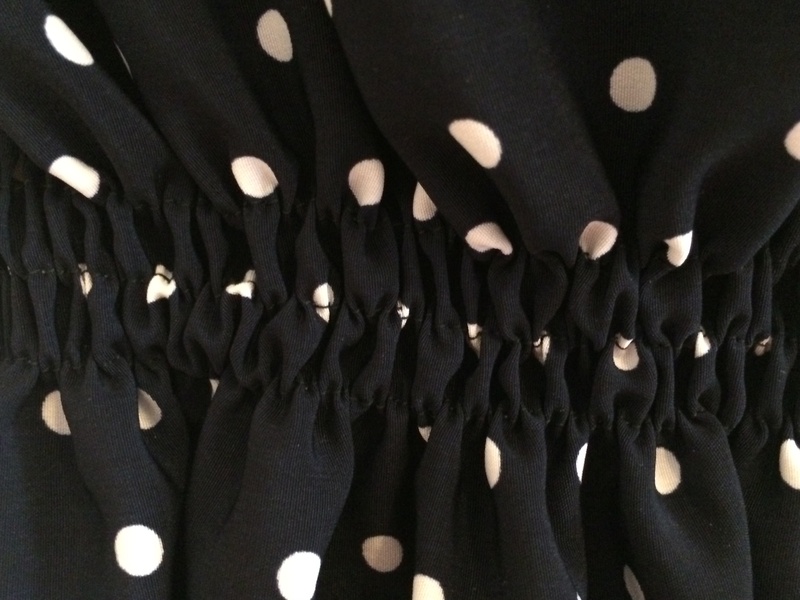 For the waistband and ties, I used the same process as Tilly uses for the Miette skirt, you can find it on her awesome website here! 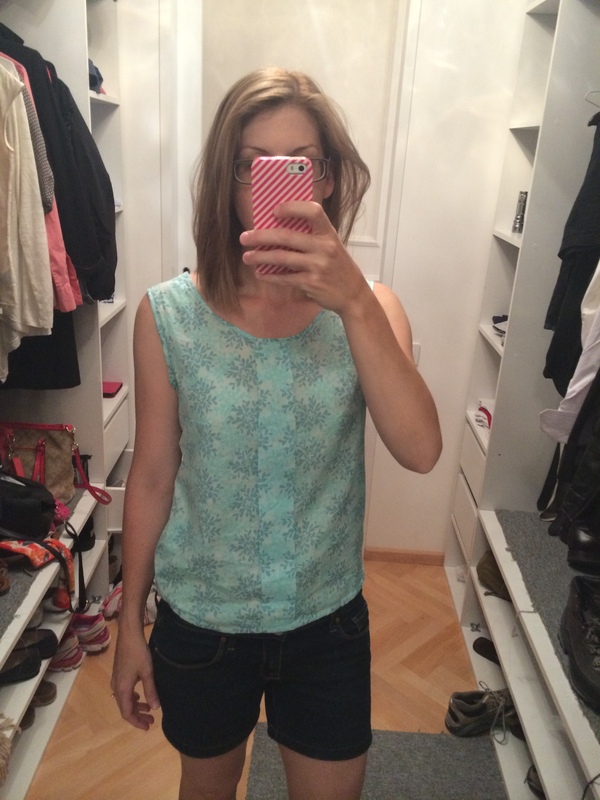 I’m so happy with how it came out for a self-drafted pattern, and although it’s just a tad too big, I’m definately going to be wearing this around Tbilisi this summer!! 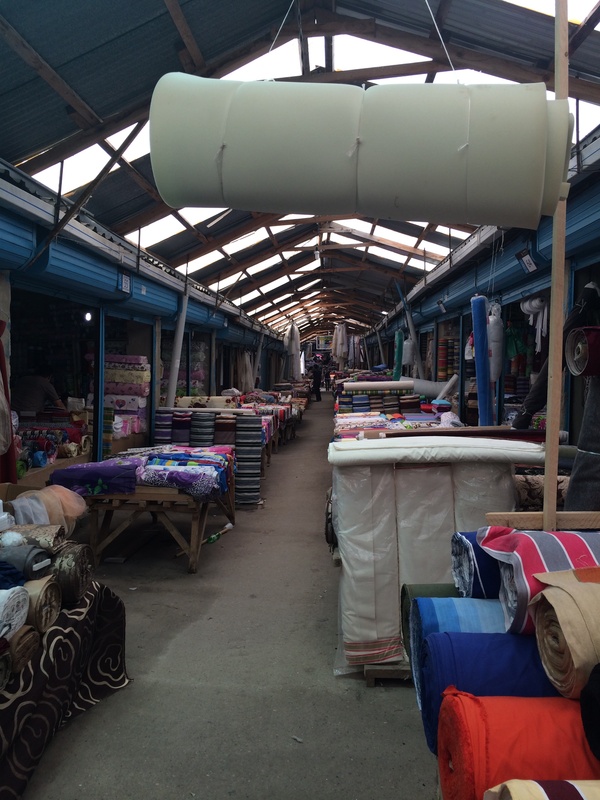 Now I need to also work on my photography skills…. 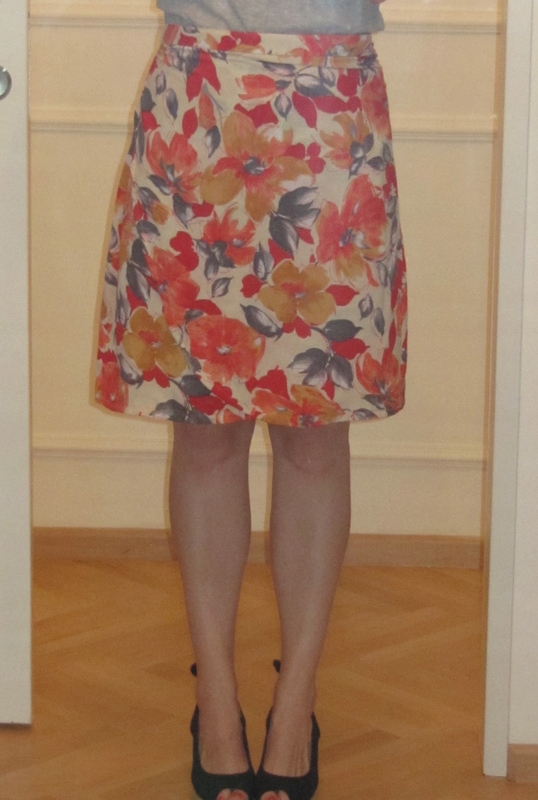 that was the best picture of me in the skirt out of around 20 – I’m definately not in the ‘selfie’ generation! 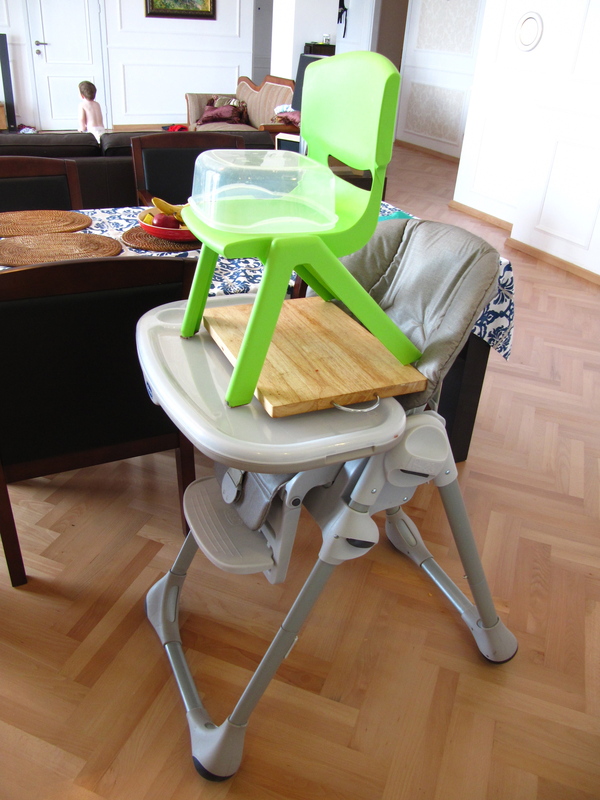 Since my sewing machine arrived a couple of months ago, I’ve only sewn ‘easy’ things like a flannel/minky blanket, pair of shorts for bubba and some new strap covers for his pram – this has been due to a lack of material in my stash & not knowing where to buy material here in Tbilisi. So it has really been since November last year (when we moved from Melbourne) that I have sewn anything finicky, you know, those type of projects you actually need to really concentrate for… and my toddler was only just 12 months old then and was a lot less mobile and inquisitive than he is now! It was sooooo much easier sewing when I could strap him in a little bouncer chair and give him a toy, or pop him in his gated playroom right next to the kitchen table and sew! I am finding that managing sewing time with looking-after-a-toddler time is a lot more difficult! 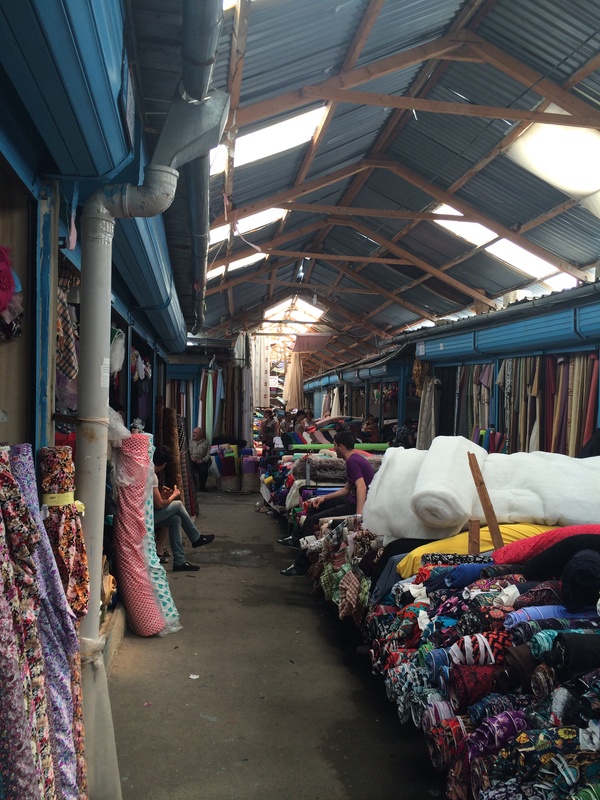 Especially since I’ve gotten my sew-jo back, have some cool materials, and have so many awesome ideas in my head…. but my little man has other ideas. He thinks its hilarious to sit on my fabric when I’m trying to cut a pattern. Or run up and slide on it just as I’m trying to line it all up properly. He also thinks its hilarious to sit under the desk and try and run off with the foot pedal…. or when I’m not looking, gets up on my chair and tries to grab the thread off my overlocker — And after having to rethread it about 5 times last month when it was playing up, that almost gave me a heart attack… Picture a slow motion “nooooooooo” while lunging at him from across the room! 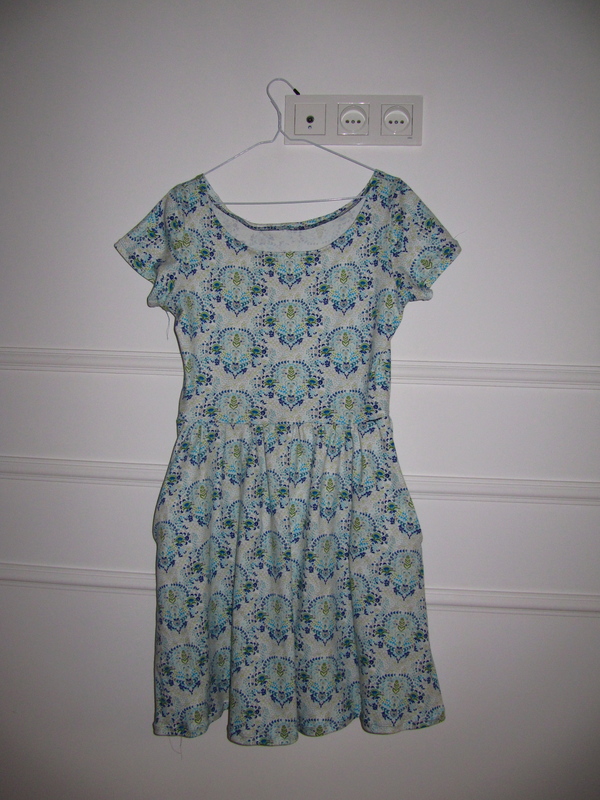 Anyway, as we haven’t yet bought a printer, I haven’t find any shops here with paper patterns, and really don’t want to ask my husband to print out a few 40 page patterns at work, I picked out a simple style dress in my cupboard (that I bought in 2008!!) 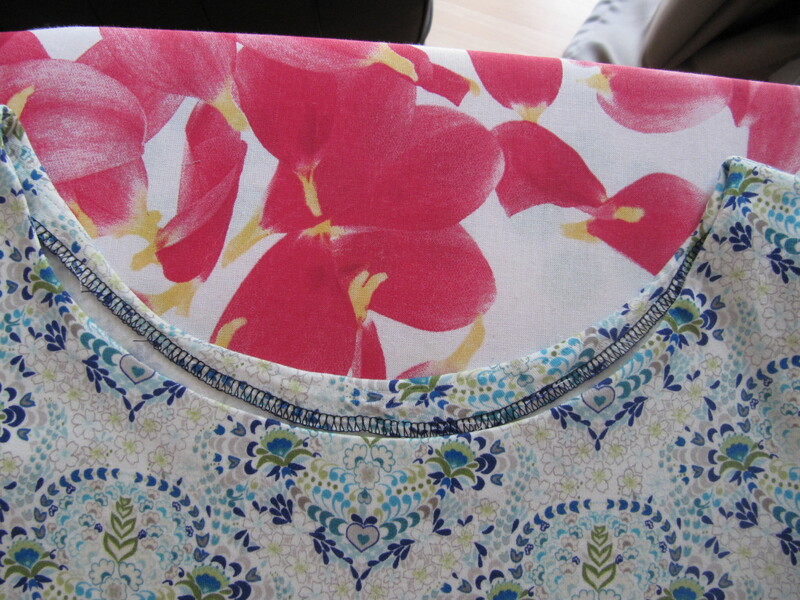 that is a nice fit and thought I’d use as a template – as I’ve been DYING to sew something for me!! 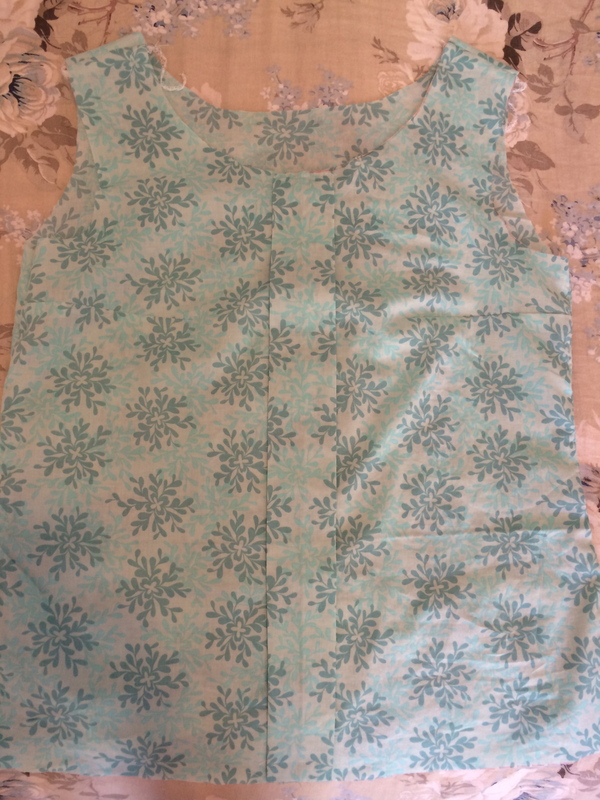 I unfortunately cut the neckline a little too wide and lets call the sleeves “fitted” to put it nicely… but this was a great project to learn a few new techniques, like using facings on the neckline and sleeve openings, and shirring the waist instead of using elastic (like in the dress I was using as a template). 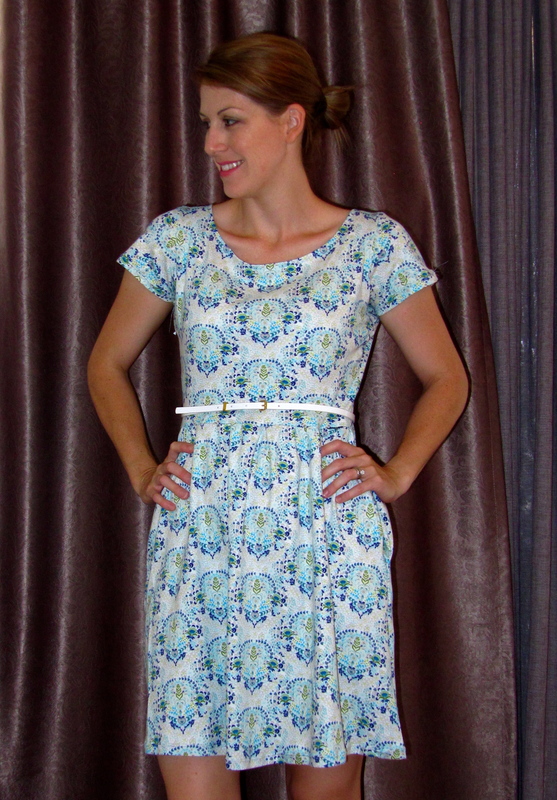 I have never shirred before, but thanks to an awesome tutorial that I found by Pretty Ditty (here) I got it FIRST GO! Very impressed with myself. Unfortunately I didn’t have any thread to match the material and was sewing this late at night so made do with the best I could find!! I have now got some dark blue thread so can use that to hem the dress tonight! 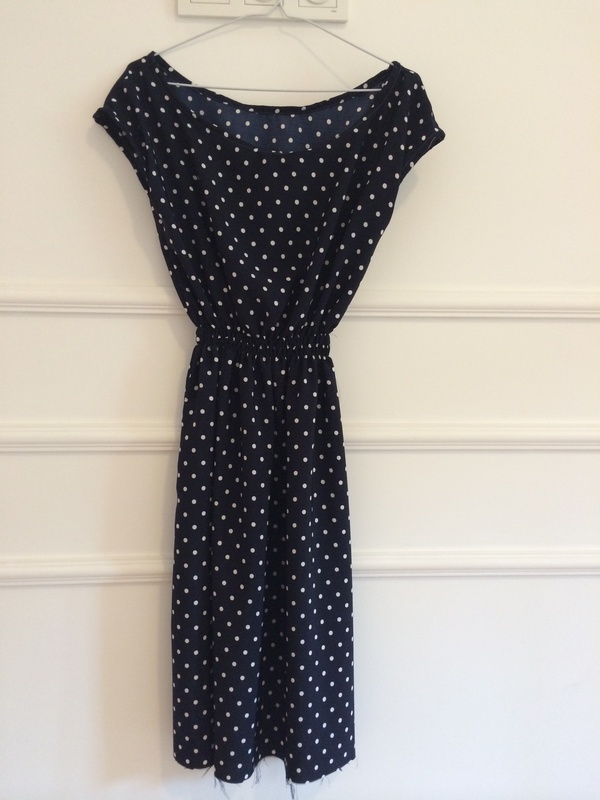 Ok, off to hem this dress and have a think about what next to sew… any ideas for sheer printed fabrics until my fabric.com order arrives?!! I’m very well aware from the amount of blogs, Facebook pages & groups, Pinterest pages, etsy shops and online fabric stores that I am not alone in my love of all things fabric, sewing and crocheting. 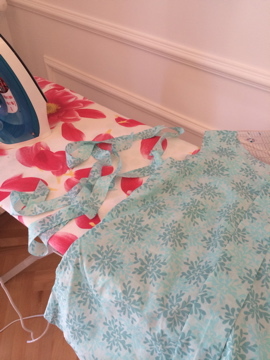 There are now so many fantastic sewing and crafting blogs, giving tutorials on everything from sewing a button on to a shirt, how to cut fabric properly, how to insert an invisible zipper, to how to construct a fully lined dress! I know because I have used all of the above and much much more over the past 2 years. While I was waiting anxiously for my sewing machines to arrive 5 months ago, I even learned how to crochet from watching some video tutorials via some awesome crocheting blogs. The purpose of my blog is to give myself motivation to finish projects (yes, self confessed UFO hoarder here…) and to keep myself from going crazy while living in a non-English speaking country with a 18 month old toddler! 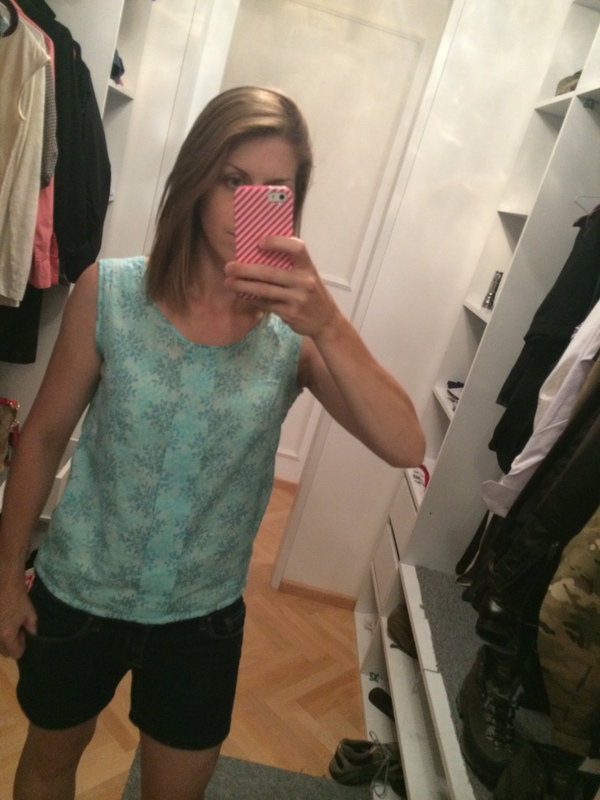 I currently have a babysitter come in 2 days a week to get some much needed sanity time …. And I have grand plans of that time now being used to tuck myself into a booth at the local coffee shop, download my pics and write about my sewing projects for that week! I hope to bring some fun & interesting projects to this page to inspire others & will share all my favourite tutorials that have helped me so far through my sewing journey!